Yesterday SK Rapid hosted a press conference at their (still under construction) new stadium. With work progressing very well, handover is planned for June 30 and opening game on July 16 is perfectly safe. That’s why on that day, at 6pm, Rapid will face famous rivals from London, Chelsea FC. 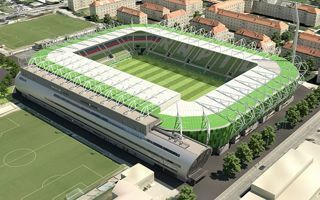 This will be the second stadium to be opened by Chelsea in this part of Europe, following the 2014 inauguration of Groupama Arena in Budapest. Tickets for the game will be available in two options: a welcome package (including also a scarf and prepaid card to operate within Allianz Stadion) and single ticket. First package costs €40-60 ($45-70), depending on seat. Meanwhile regular tickets begin at just €20, which by Viennese standards seems economic. As we informed you on Friday, Rapid had already sold 10,000 season tickets for the upcoming season. Now that figure is at nearly 12,000 and sale will end once the cap of 15,000 is reached. With the great enthusiasm shown by fans, Rapid now has a goal of 20,000 people per game. That’s a game-changing number in Austria, where no club was able to reach that level in this century! Rapid currently draws under 17,000 per game at Ernst-Happel-Stadion, so the plan seems very realistic. Worth mentioning, at present no other club in the country even reaches 10,000 per game. With this boost Rapid officials now expect their budget to reach €30 million ($34m) per year, which doesn’t even include additional transfer fees and European competition group stages. If other teams don’t shape up and follow suit, this may mean Rapid’s dominance domestically.